Usually on Thursday I post a recipe. 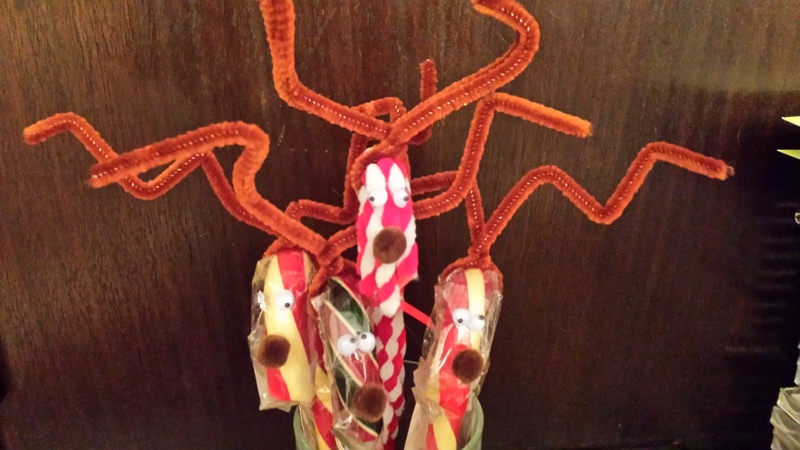 Today I’m mixing it up and posting the directions to make these sweet Candy Cane Reindeer. They’re a perfect place card holder at a party, incorporate beautifully into the ribbon wrapping a package, or just hanging out as these guys are! They are featured in “Dying for Holiday Tea,” one of the novellas in the anthology in Happy Homicides 1: Cozy Holiday Mysteries. 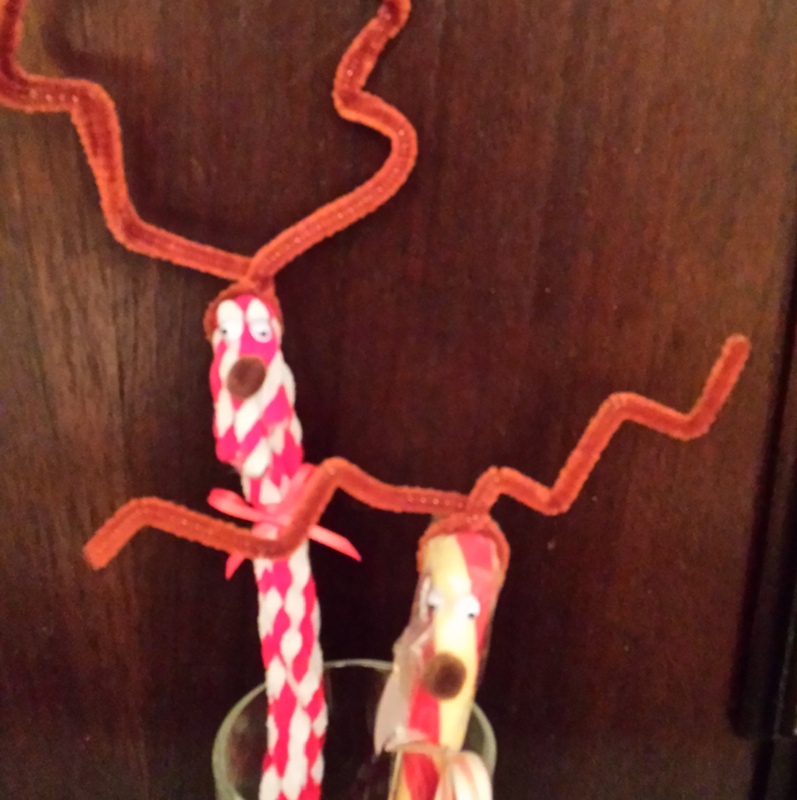 Holding the candy cane, wrap the pipe cleaner around the curve and twist. Bend the long ends to make antlers. Put a dab of glue on the front of the short end of the candy cane to make a nose. Put two smaller dabs of glue above the nose, for the eyes. Lay the candy cane down until the glue dries. This is one of the crafts included in the free bonus pdf file of recipes and crafts for Happy Homicides: Thirteen Cozy Holiday Mysteries. My novella, “Dying for Holiday Tea,” is included in this anthology written by thirteen authors. Cream Cheese and Olives is a long-time family favorite. My mother would make this to take on road trips, because she could make sandwiches while we were driving without making a mess. My favorite way to eat it is on Triscuit crackers. I have put it on toasted English Muffins, eaten it on whatever cracker was handy, and made little rolled sandwiches with white bread. In the fast and easy department, it doesn’t get much easier than two ingredients. It makes an appearance at our annual sausage party (where friends and family gather to make lots of Italian sausage). 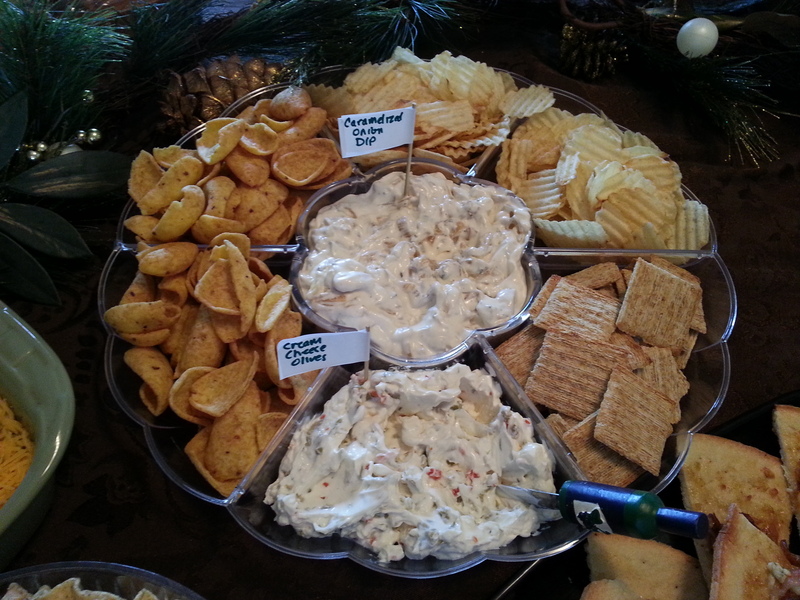 It shows up in “Dying for Holiday Tea” with the green olive and red pimento giving Christmas color to snowy cream cheese. In a bowl, place the brick of cream cheese. If using full fat cream cheese, let it come to room temp before making this. If using 1/3 reduced fat cream cheese, it is soft enough to use right from the frig, but I usually let it soften for a bit anyway. Chop the olives as finely or as coarsely as you prefer. I prefer using a knife, but to get a finer chop, I’ll use my chopper. Use a fork to mash the cream cheese, add the liquid from the olives, and add the chopped olives. Mix to combine. Put in a container and refrigerate. The flavors develop best when chilled for at least 30 minutes or overnight. Sometimes I don’t want to wait that long, and adding the olive liquid helps give the cream cheese olive flavor before chilling. If I’m taking it to a party, I’ll make it the night before. 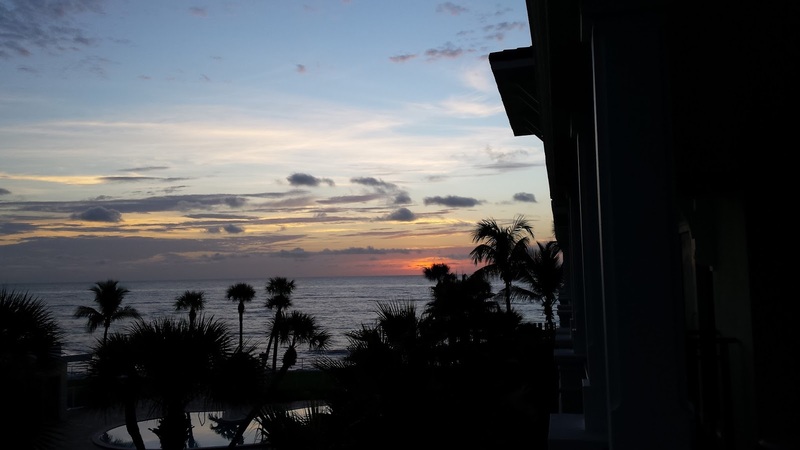 We’re celebrating at the Vero Beach Hotel & Spa for two nights, enjoying a staycation. We sat on the balcony and watched the sunrise, and then walked down to The Lemon Tree for breakfast today (and plan to tomorrow). Later today we’ll go to an 11:00 movie, have a late lunch, and then relax at the pool bar with $5 Margaritas. We’ll have dinner at Cobalt with friends, and head back into real life tomorrow. I’ve been proofreading Happy Homicides 1: Cozy Holiday Mysteries. It is an anthology written by twelve authors, and includes a link to get a bonus file of recipes and crafts. It goes on pre-sale September 15, and on sale October 15 – perfect for holiday gift giving. At only 99 cents, it’s a great price! 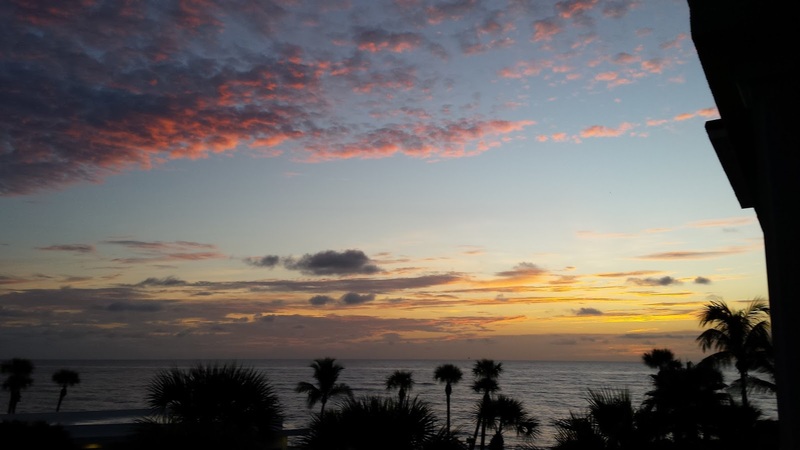 Below are birthday sunrise pictures from our balcony.